The SBA is a govenmental agency which provides funding and loan guanantees to small businesses via Certified Development Corporations (CDC) and via other lending intermediaries. SBA has grown in terms of total assistance provided and its array of programs tailored to encourage small enterprises in all areas. SBA's programs now include financial and federal contract procurement assistance, management assistance, and specialized outreach to women, minorities and armed forces veterans. The SBA also provides loans to victims of natural disasters and specialized advice and assistance in international trade. The Board's mission is to assure that quality and fair construction practices exist in all phases of the industry in order to protect the safety and welfare through the regulation of contracting by means of examination, licensure and disciplinary action. The Social Security Administration provides the nationwide financial safety net for those individuals either already receiving benefits under one of more of the following categories: 1. Retirement, 2. Medicare, 3. Disability and SSI and 4. Widows, widowers & other survivors benefits. The Wall Street Journal is the place for up to the minute national and global business news. Many of the news articles have audio and video clips. 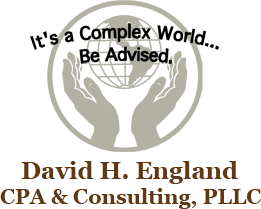 © 2019 David H. England, CPA & Consulting, PLLC All Rights Reserved.